Call me old school. Call me crazy. Call me whatever you want. But, you can’t say I don’t know my times tables. When I was in third-grade, my teacher made us memorize our multiplication facts. Thank you, Mrs. Lucas! The foundation that was laid during my third grade year, specifically in mathematics, was priceless for my education. As I watch my upper elementary students struggle with certain math concepts, it makes me furious. So many tasks they stumble over include a hurdle that could be cleared with instant multiplication knowledge. But, that’s not “how they do it” anymore. Well, guess what?!? This road mom is teaching her learners to multiply and we are doing it with a basic foundation by MEMORIZING the times tables from 0-12. My biggest pet peave in this area is the “9s” trick. So. Instead of my kid spending the time needed to learn 10 invaluable facts (1 x 9, 2 x 9, 3 x 9, etc. ), he was taught a sassy little math trick. It involves taking the product of the equation and the process of elimination with your fingers (yep, I said your fingers) to come up with the answer. Did you understand me, right? Yes, he was taught to multiply the 9 times tables ON HIS FINGERS. Brilliant. Thanks, anyway. Regroup and restart. 9 x 9 is 81. That’s a fact. I will guarantee I know that 9 times faster than anyone who comes up with the answer by “bending their 9th finger down to reveal 8 fingers on the left and 1 finger on the right… viola’ for the answer of 81”. It’s a nifty little trick and something to ponder as a strategy, I suppose… AFTER you memorize your 9‘s. First, learn the 0’s. The only answer for the whole 0 times tables is zero. Easy peasy. It’s a confidence builder for your math learner. Next up, learn the 1’s. They are a mirror. Show your new little math wizard the number is it being multiplied by like a reflection in a mirror. Moving on to the 2’s is smooth sailing. Everthing is doubled. The next logical steps are the 5’s which are like nickels and then the 10’s which are like dimes. The last part of this part of the plan involve the 11’s which are easily taught by illustrating that any number 1-9 times 11 is a double digit of the same number. After these facts are all memorized, your learning sponge will be encouraged to know he has already learned half the times table facts. 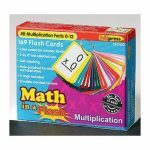 By this point in the multiplication game, these facts should be memorized so that they can be revealed in 3-5 seconds with no hesitation. The last half of the multiplication mastering system involves good, old-fashioned memorization. First up is the 3’s, followed by the 6’s, 9’s, 4’s, 8’s, 7’s and finally the 12’s. There’s no fancy-shmancy system to this except for repetition and memorization while learning the facts in this order. Starting with the 3’s, learn the facts from 3 x 0 through 3 x 12 and giving the answers when prompted by flashcards, within 3-5 seconds. After the 3’s are masters, move onto the 6’s, and so on and so forth. In reality, this process should take no more than a couple of weeks, depending on the motivation of your student. Practice makes progress! When I introduced this to my boys this past week, they were all about it. I created a printable to keep track of their success. Ironically, I got this idea from my third-grade memories as well. Back in the day, Mrs. Lucas had a big poster board with everyone’s name down one side and columns from the 0’s through the 12’s across the top. As you memorized your facts, a single foil star was placed in each column to signify your success. Oh, how I couldn’t wait to get all 13 stars across from my name! Our free printable, Times Table Triumphs, is sponsored by Road Trip Teacher and is formatted on an 8 1/2″ x 11″ piece of card stock. There’s a place for a sticker or symbol of your choice to indicate the success of each digit multiplied and mastered. Guess what? My sixth grader, who has struggled forever with multiplication (and hence, division), memorized the times tables in less than a week. His triumphs are recorded proudly on the sheet and stored in his binder. 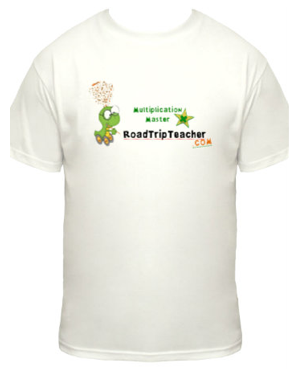 I even sweetened the deal by ordering Multiplication Masters t-shirts for everyone who achieves this arithmetic riddle. 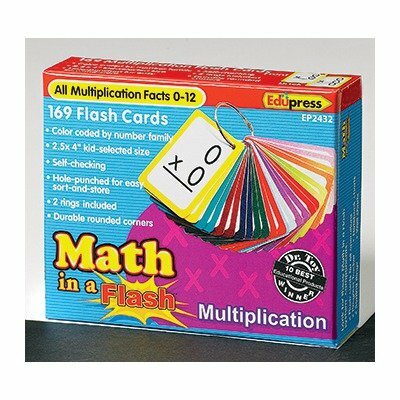 Note: We used Edupress’ Math in a Flash multiplication flash cards for this exercise. I love this set of flash cards because it comes with the cards pre-hole punched to be stored on a ring (also included). Also, there are ALL multiplication facts from 0-12. For example, there is a card for 2 x 3=6 but also for 3 x 2=6. 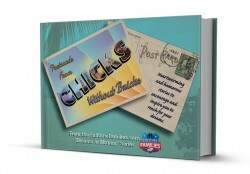 The set is also color-coded by color family and are a great kid-friendly size. Order yours through Road Trip Teacher today!